The crunch with these was more on the regular Chips side than the Kettle Cooked side. However, the fact that they were Kettle Cooked meant there was sufficient oil to give them that crisp, snappy bite's-worth of crunch. These were just about as thin as Kettle Cooked Chips can be. This meant the hot oil raised the roof with an undulating bubble popping surface. There was little in the way of seasoning, but there was some brown edges and blotches. Not particularly greasy to the touch either. 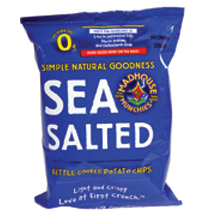 We have seen Chips marketed as All-Natural-brilliant-and-healthy, that have double the sodium content of these Chips. This was also evident in the flavor - there was little salt so the taste was mainly potato oriented. Regular visitors to our review pages will know that we do not consider ourselves very good at reviewing plain Chips - we crave flavor. If a sandwich needs to do the work of providing flavor, why bother! Having said that, these had a warm and fluffy potato taste that was enjoyable, if a little bland.